Atlantis has returned to Earth. The team members have dispersed and are beginning new lives far from the dangers of the Pegasus galaxy. They think the adventure is over. 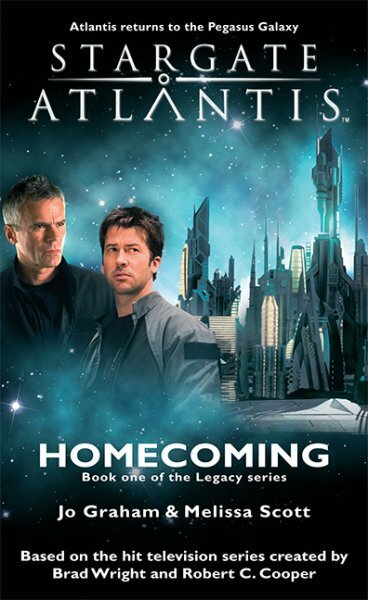 Picking up where the show’s final season ended, STARGATE ATLANTIS: Homecoming is the first in the exciting new STARGATE ATLANTIS Legacy series. 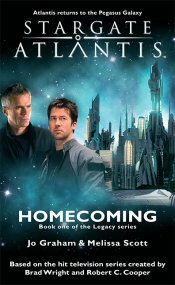 These all new adventures take the Atlantis team back to the Pegasus galaxy where a terrible new enemy has emerged, an enemy that threatens their lives, their friendships — and the future of Earth itself. The city shook, but it was not as bad as before. Zelenka could keep his feet easily enough, hanging on to the edge of the console. The cameras fogged, vapor streaming past. A high cloud layer? Possibly. Probably. All systems were still green. The ZPMs’ power level was ticking downward, but not quickly. Fifteen per cent…fourteen per cent. Thrusters fired again, tilting the city slightly, increasing the drag. The shield pulled more power to compensate. And the city slowed. Ice. The cameras showed ice below, thousands of feet down to the north polar ice cap. They were wrapping around the world in a high polar sweep, bleeding speed as they went. Ice. Nothing but ice. Surely they would start seeing water now. He didn’t know how high they were. It all looked the same, sixty thousand feet or thirty thousand. “You need to course correct,” Rodney said.